One of the readings for my Digital Rhetorics class this week, William C. Kurlinkus’s “Memorial Interactivity: Scaffolding User Experiences,” deals partly with the concept of viral nostalgia. After some deliberation, I decided that my blog post would connect Kurlinkus’s viral nostalgia with the 2014 horror film Unfriended. While I initially considered connecting this week’s reading to early reaction videos, I found this topic a bit more fruitful for me (I’m currently putting together a conference paper on Unfriended and the digital ghost story for the first Supernatural Studies Association Conference on March 23rd!). While I’m not pulling something directly from the Internet, I am examining a representation of social media participation. Additionally, Kurlinkus discusses the importance of “surprises” in creating digital nostalgia in user experiences, something which is very important to the horror genre. I quickly found myself eager to discuss the focus on surprise in horror and Unfriended, as well as how this can support Kurlinkus’s point. The trailer above should give you a good feeling for what the movie is about. It’s most groundbreaking feature is the fact that the entire film takes place on the lead character, Blaire Lily’s desktop screen. The digital ghost, Laura Barns, seeks revenge on her supposed ‘friends’ by infiltrating their social media accounts, desktop folders, and email. That’s all you really need to know. Video challenges and memes encourage others to participate in its “event” through creation. Videos and memes in this sort of scheme are created by following a set of rules or a clear formula. 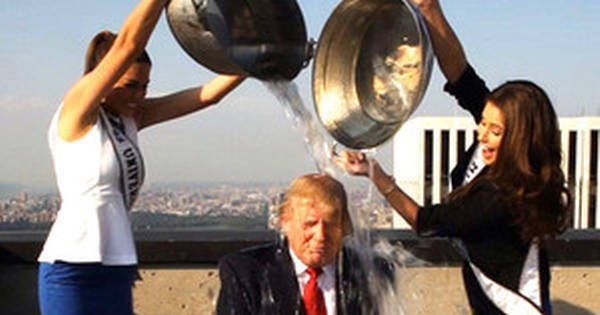 For example, in the Ice Bucket Challenge, the most basic rule is that you must film yourself getting a bucket of icy water poured over your head. These creations are heavily personalized, as Kurlinkus mentions, which is what gives viral nostalgia its potency. The care put into creating such a personalized product gives the product meaning, which makes it memorable. Finally, the “challenge” itself entails the creation of a product, or to borrow Kurlinkus’s phrase, “behavioral residue.” The production of residue creates further nostalgia as it anticipates a future in which the creator can re-watch his or her own past. Thus, viral nostalgia describes an occurrence in which many participants seek to recreate an original moment via copies. The copies can never be true replicas and this allows for personalization and meaning. Unfriended opens with Blaire (although we only see her cursor at this point) playing a video on the streaming service Liveleak.com.1 The video is of Laura Barns, standing alone on a basketball court. Although the image is blurry and shaky (it looks like it was filmed on a smart phone), the viewer can see Laura slowly raise a gun to her head and shoot herself. Immediately, a number of concerned adults (teachers?) and teenagers (friends? students? peers? bullies?) rush towards her body. 2 There’s a lot that can be said about the presence of death online, as well as how easy it is for users to find and view “real death” online and how difficult it is to police such content. Shellie McMurdo does a wonderful job examining this aspect of the film. For now, I’m just going to table these issues here and maybe cover them in a later blog post. Although never directly explained, the fact that Laura Barns’s suicide was recorded, uploaded, streamed, and went viral online, could have something to do with why she is able to return one year later as a vengeance-seeking digital ghost. Unfriended goes out of its way to make clear that anything that goes online will never die or disappear. What happens if we view this initial suicide video as the original video in a case of viral nostalgia? After Blaire watches this video, she meets with her five friends in a Skype chat which feels like a weeknight ritual. It is within this Skype chatroom that Laura (under the guise of “Billie227”) exacts her revenge, picking off the teenagers one by one. 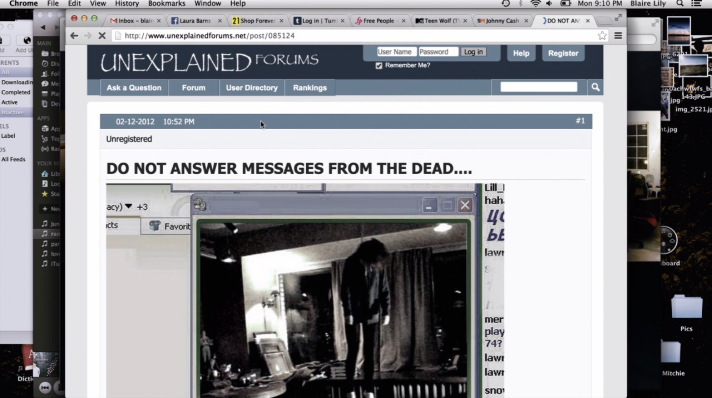 According to the film’s logic, if you respond to a ghost online, you open up the door for the spirit to infect your computer, social media accounts, and your biological body and mind. Laura kills each teen by overriding their brains and controlling them to commit suicide on camera, while forcing the others to watch via Skype. Each of these new suicide videos seem to fit Kurlinkus’s concept of viral nostalgia. Laura yearns to recreate her own suicide through each copy. There is a return of the repressed as the ghost, who is the host of trauma, according to Lisa Blackman, forces those who she blames for her own death witness each reenactment. Of course, as Kurlinkus notes, a perfect replica is impossible. In Unfriended we instead see a gothic version of personalization in viral nostalgia. Val (probably) chugs bleach (she was doing her laundry when her video was made), Ken is brutally killed with a food blender (earlier he showed off the fact that he was making his salsa, infamous for the monstrous farts it creates), Jess is killed by placing her curling iron in her mouth (Laura adds, “Maybe she will finally shut up!”), Adam kills himself using the gun he waves uselessly throughout the film, and… I guess I’ll stop here to leave you some reason to watch the movie if you haven’t yet. The point is that each of the recreations of Laura’s viral nostalgia is personalized, yet they also add to a collective memory and story. Secondly, the viral nature of Laura’s haunting is also displayed through the fact that she is able to take over and override their computers and bodies (like a computer/biological virus) to potentially create more digital ghosts (they all died online like Laura). At one point, the multi-tasking Blair reads through a site sent to her from her boyfriend Mitch. It explains that you should not answer messages from the dead online, from which audiences can infer that this is not an isolated incident. There are other ghosts out there in the invisible yet ubiquitous digital network. According to Lisa Blackman, social media and transmedial storytelling allow for new realities and new conceptions of time and space (17). Unfriended applies both in its narrative, as Blaire (and Laura) moves between Youtube, Skype, Facebook, Google, Chatroulette, and Spotify. Each character’s Facebook and Skype accounts (including Laura’s) were created in “real life” as part of the film’s advertising campaign. According to Blackman, this move blurs past, present and future, while social media’s role also defamiliarizes space. Although the teens are not actually together, they are only “together” in a Skype chatroom while physically distant, each in their own homes, the audience doesn’t feel their isolation immediately. If the past is able to blend into the present through the use of multiple medias, or through the use of photographs and videos on our social media accounts, can nostalgia truly be part of these viral campaigns or of digital hauntings? Can there even be a digital ghost, or are we all ghosts online? Viral Nostalgia in Levan Gabriadze’s Unfriended (2014) by Caitlin Duffy is licensed under a Creative Commons Attribution-ShareAlike 4.0 International License. I loved your “fun clickbaity” post! I saw this movie last year. It was such an amazing idea. I was a little disappointed with how bluntly they executed (no pun intended) the consequences although I’m pretty sure that they wanted to entertain the gore-seeking horror fans on a low budget. I’m very interested in your pointing out a possible ethical concern about the ARG that preceded the movie’s release. I doubt that they meant to trigger mental health issues, but the vulnerability of people to information they see on the internet (video seems much more “triggering” than mere words) is quickly stimulated. I think as you imply here nostalgia is part of the picture; this is the “safe” aspect of social media that we are meant to relax in and enjoy, recapturing a lost nirvana that we either lived through or fantasize we did. I think you’re right regarding the “executions,” especially in regards to the limited budget (which often both helps and hinders horror films, including this one). I’m excited to hear that a sequel has already been filmed and shared at the SXSW festival, where it has already received a fairly positive response. It’s called Unfriended 2: The Dark Web, and is produced by Blumhouse, a power-house for the horror film industry. I’m interested to see what happens with this movie, as it will not only have a better budget, but it also is getting rid of the supernatural in favor of monstrous human behavior online. We shall see! I like this idea of the “safe” aspect of social media existing within its nostalgia potential. The memories housed on platforms like Facebook are only there as a result of our constant (free) labor. The desire to gain cultural capital from “likes” can lead to unethical behavior like the Unfriended filmmakers and characters both posting a suicide video online. Hi Caitlin, what a great example. I haven’t seen this movie, and the idea of death by food blender is very intriguing 🙂 This also seems to be an example of (forceably) stimulating recall mechanisms in that the social media interactions apparently continually linked back to specific incidents in Laura’s last days and to her death. I really like your idea about Laura and the social media power she wields “(forcibly) stimulating recall mechanisms,” especially given the clickbatey (to steal Jon’s term) nature of a lot of viral nostalgia.